Being open about her own struggle with mental illness is an important aspect of Simone Aslan’s initiative. She says she wants to dismantle stereotypes that discourage people from opening up about their issues. For some of the 20 per cent of Canadian teens who have reported suicidal thoughts in the past year, getting treatment isn't always a walk in the park. 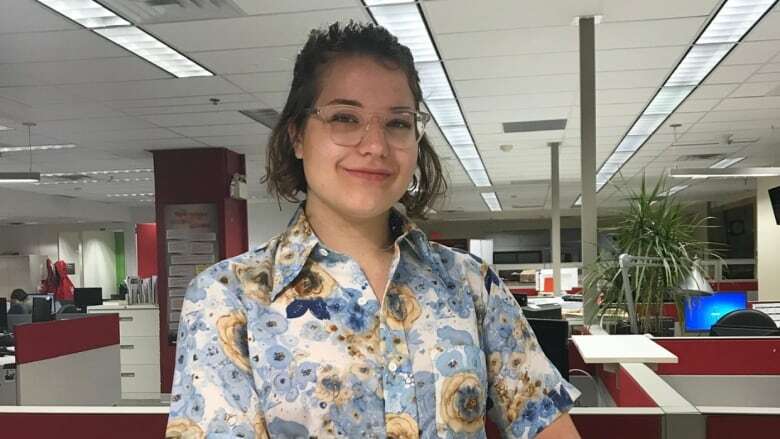 That's what 17-year-old Simone Aslan noticed when, last November, she was admitted to the Montreal Children's Hospital for clinical depression. She said she saw lower-income patients who had nothing, in a room next to other patients who had basic comforts like pillows and books brought from home. "The hospital does what it can, it has basic care items, but it is struggling to have the proper items for everyone," she told CBC Montreal's Daybreak. Months after her time in hospital, Aslan decided to start an initiative to help the patients at the Children's Hospital who don't have access to basic care items. The campaign is called Bare Necessities. Aslan purchases bulk items such as shampoo, tampons, pads, underwear, socks and pants. Then she gets recreational items like colouring books. "[That's] something that I knew they didn't have when I was there," Aslan said. "I wanted to help the hospital because of how they helped me." Her initial goal to raise $5,000 was achieved within three weeks, she says, and she now has raised about $6,900 through her website and fundraising page. With it, she's purchased 200 blankets, 150 pairs of sweatpants, 400 pairs of underwear, books, crayons, toothbrushes and more. "I was blown away by the support of the community," Aslan said. Initially, Aslan had the idea to make care packages, complete with teddy bears, blankets and games. But after meeting with the hospital, it became clear that more basic products were necessary. "They told me, 'At the base, it's important to be clean,'" she said. "To feel good on the outside, it means you'll feel much better on the inside." Being open about her own struggle with her mental health is an important aspect of Aslan's initiative. She says she wants to dismantle stereotypes that discourage people from opening up about their issues. "I think we need to talk about it more," Aslan said. She says that everyone has had a moment in their life where they don't feel 100 per cent, or they know someone who's been mentally ill.
"[If I] continue to be open about it, I can hopefully help to destigmatize this idea that you can't be sad, you can't have times when you don't feel good about yourself."